Radio controlled computer clock with remote antenna (IP65). Server ARC with remote antenna (IP65) Consists of mains powered Atomic Radio Controlled Computer Clock with remote antenna up to 200m (600 ft) away. It has an integral Time display and signal strength indicator, serial interface (USB optional), LED signal display, power supply and converter. Synchronises to the DCF time signal. The Server-ARC Atomic Radio Clock is an advanced radio time code receiver. 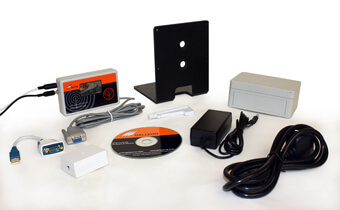 The antenna is rated to IP65 and can be wall mounted indoors or outdoors up to 100m from the host computer. The unit is specifically designed to provide good signal reception in areas with a poor radio signal. TimeSync NTP can be used to turn any Windows 98, NT or 2000 machine into a stratum 1 NTP time server resource for your network. It can be used to synchronise the time on any NTP network clients on a TCP/IP network to within milliseconds of the correct time. Provides accurate timing for any number of network time clients. Reliable, accurate and secure timing resource, inside your firewall. Ideal for transaction processing, time & attendance and access control applications. AC-700-DCF clock + power supply.